Behold the halo effect of the new commercial space biz: Zero-G, a company that specializes in flying passengers on modified jets to simulate orbital weightlessness, just got approval to train passengers and crew for simple spaceflight. 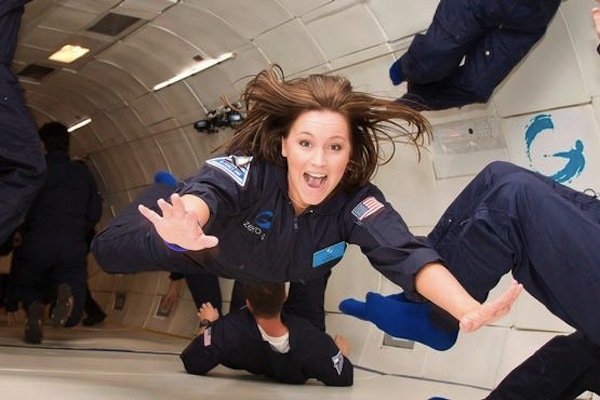 Behold the halo effect of the new commercial space biz: Zero-G, a Vienna, Va.-based company that specializes in flying passengers on modified jets to simulate orbital weightlessness, just got safety approval to train passengers and crew for simple space flight. And lest you begin worrying this new era is all about pointless fun and not science, the company can help researchers prepare their gear before flying it into space. The Federal Aviation Administration’s approval basically says Zero-G can safely and reliably supply a flight environment that replicatea the kind of flight conditions that passengers, crew, and experiments will find aboard the upcoming group of suborbital joyride spacecraft like Virgin Galactic. By flying in a parabola at high altitude, Zero-G can simulate space conditions, as well as the low-gravity conditions that passengers will experience as their spaceplanes begin to re-enter the atmosphere. Zero-G is careful to note that its flights are ideal environments to test experiments that will later fly aboard a spaceplane, to verify everything’s set up properly and minimize risks of a technical failure. Jokingly, the firm’s previously tried the famous Coke and Mentos experiment during a parabolic flight, and though utterly lighthearted, the clip does prove that unexpected experimental design flaws can be revealed, cheaply. The new push for enabling small- to medium-scale commercial space industries in the U.S. is already having an effect in a host of ancillary businesses that support it. This will, of course, generate jobs and money. And, in the case of Zero-G, fantastic amounts of fun.